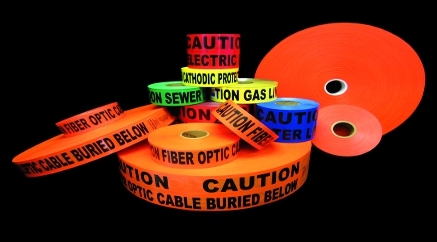 Fiber Optic, Telephone & CATV Warning Tape | Reef Industries, Inc.
Terra Tape® underground warning tape is ideal to protect against accidental dig-ins of fiber optic cables. Terra Tape® is an extrusion laminated underground warning tape available in detectable and non-detectable grades and serves as a visual signal to stop digging because further digging will harm lines below. 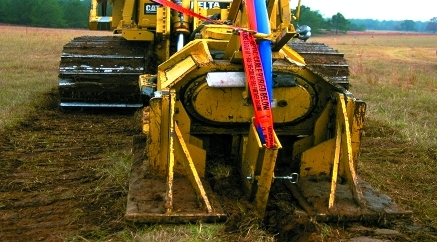 Terra Tape® Extra Stretch™ underground marking tape is specified the world over to protect fiber optic cables. Extra Stretch™ is a highly visible signal to alert backhoe operators or other jobsite personnel to stop digging immediately. Protect your fiber optic cables from service interruptions and unnecessary repair expenses and invest in Terra Tape® underground warning tape. All Terra Tape® products can be custom printed with your name, logo, phone number and/or message in up to four (4) colors and any language. Terra Tape® is also available in other material grades including detectable warning tape. Posted signs rarely prevent dig-ins. Terra Tape® underground marking tapes are specified the world over as a warning system to protect against accidental dig-ins and to alert workers of buried telephone cables. 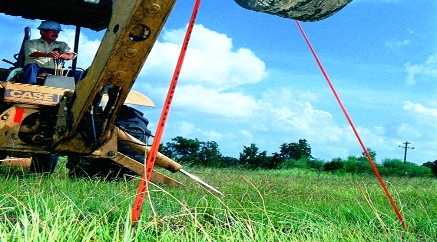 When dug up, Terra Tape® will stretch up and out of the ground in one continuous piece alerting the operator to stop digging immediately. Our underground marking tapes are designed to suit your budget and project requirements. No other product can match the unique benefits found only in Terra Tape® underground warning tapes, the protection you can trust. Underground marking tape that will stretch above grade level in one continuous piece. Tape with excellent tensile strength and high elongation. Suited to fit your budget. A light pigmented polyolefin film. Tri-layer laminate consisting of a printed film, a solid foil core and a clear encapsulating film. Tri-layer laminate consisting of a coated woven scrim, a solid foil core and a clear encapsulating film.